Quality church signs that help you grow and inspire. America's largest church sign company! Church signs provide the essential means of communication with existing church members, potential members and the community. Since 1968, we have provided quality signs to churches, synagogues, religious institutions and places of worship across the country and around the world. 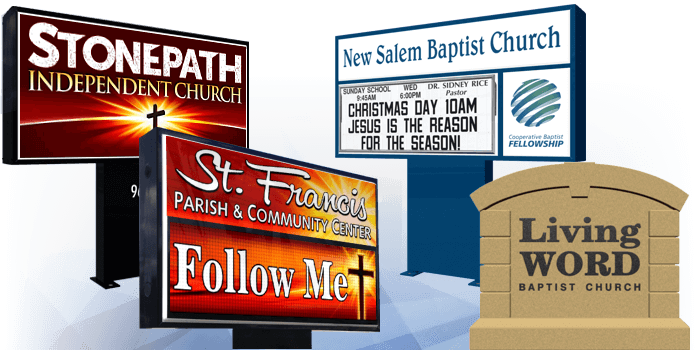 Our digital displays offer your church state-of-the-art sign technology combined with the highest level of quality and service. Project a dynamic presence into the community! When graphic appeal and boosting awareness are your focus, these signs are the solution. Identify your church, enhance your grounds and become a source of civic pride. Bring large-scale video capabilities to your events with a state-of-the-art LED video wall. Turn any wall into a dynamic centerpiece and take your church to the next level! Need ideas for what to place on your new sign? See our Church Sign Messages! visit for the first time after seeing the church sign! Why Invest in a Church Sign? Beautiful church signs to get your message out to the world.